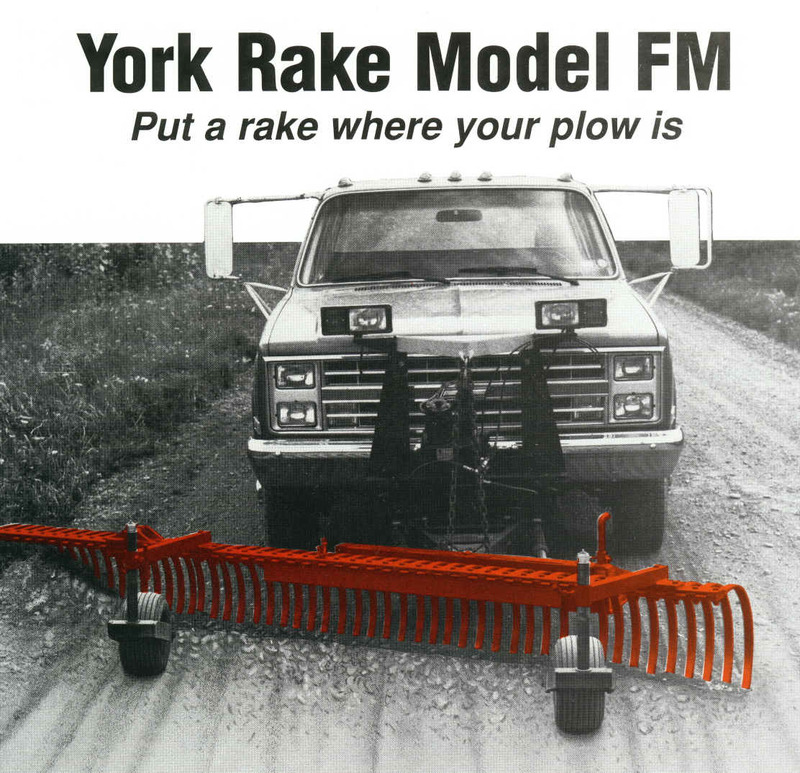 The York FM Series Landscape Rakes are front mounted landscape rakes that mount on the mounting frame of your pickup truck's snowplow. 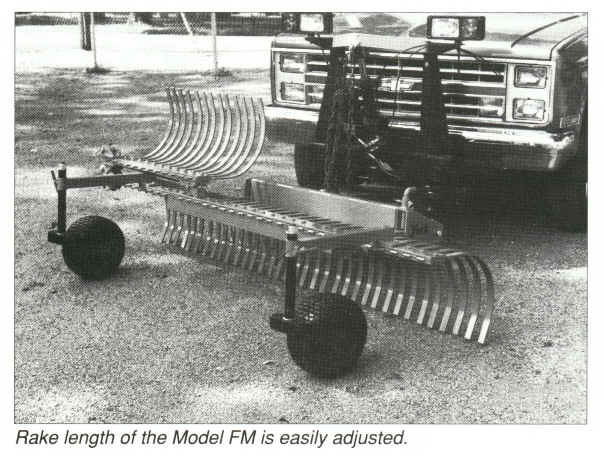 The York FM front mounted rake is raised, lowered, and angled using your existing plow controls and hydraulic system. This reliable, work-horse enables pick-up truck plow systems used for institutional, commercial, and private snow removal to be used year round. 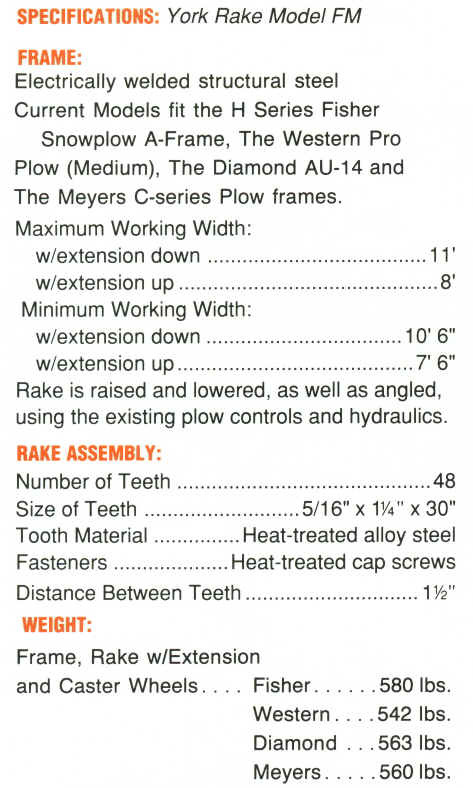 The York FM landscape rake is a sturdy, versitile companion for: removing stones and debris; grading and leveling roads; driveways and large areas; spreading topsoil quickly and evenly; and distributing crushed stone, gravel, and cinders. 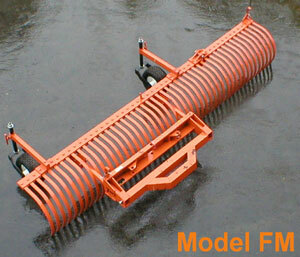 Model 7520: York truck mounted rake model FM, consists of universal A-frame mounting with angle cylinders, 8 ft. rake section with 3 ft. wing and caster wheels, unit has 1 1/4 inch wide rake teeth spaced 1 1/2 inches apart. 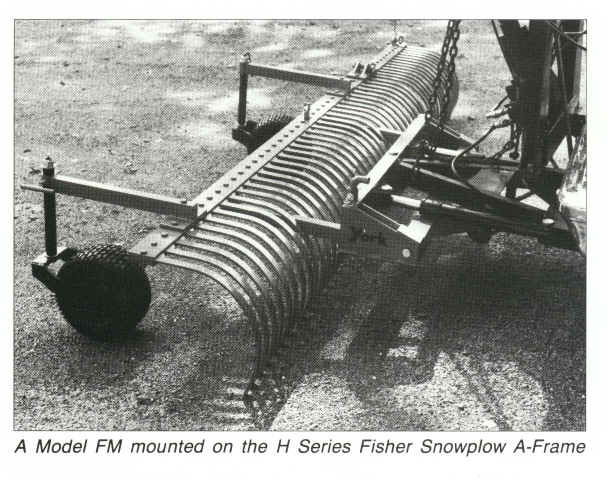 The unit with universal A-frame will mount on the snow plow frame arms of most standard plows including: Fisher Minute Mount 2 plow; Meyers-C Series plow; Western Pro Plow (medium); and Boss Snow Plow. Contact us to check if your plow isn't listed - Click the link below for the current price of this item, and/or to order. To order the unit without A-Frame And Angle Cylinders, Click the order form button above also, and then pick the "Delete Frame Option" in the drop down menu on the order page.